According to family lore, my paternal great-grandfather was from Texas and somehow ended up in Portsmouth, Virginia. After marrying and siring three boys and a girl, he deserted the family and was never heard from again. That's all the information we had to go on. Thankfully, his name was somewhat unique and it made it easier to search for him. 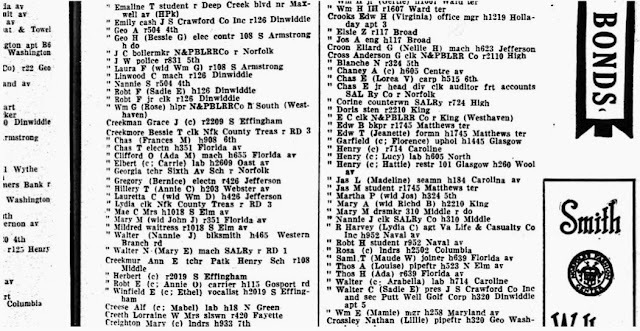 My father began the search almost two decades ago and was able to locate two potential people who might be the person for whom we were searching (based on age and race): one in Alabama and one in Texas. The one from Texas was the front runner, given the few "facts" we knew. 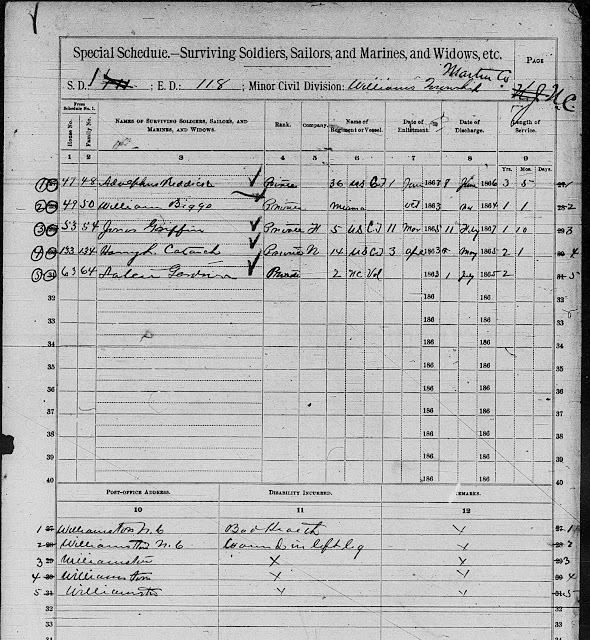 And based on that information he located a death certificate with a wealth of information. 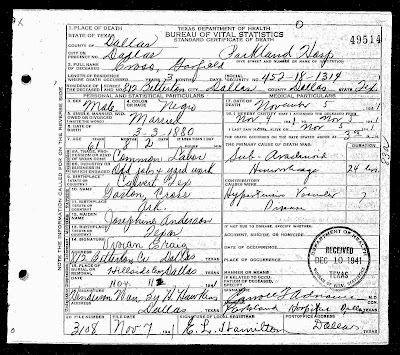 Based on the death certificate, my purported great-grandfather's father's name was Gaston (from Calvert, Texas) and his mother's name was Josephine Anderson (from somewhere in Texas). My g-grandfather died in Dallas in 1941 at Parkland Hospital (the same hospital in which our 35th President would succumb to injuries from an assassin's gunshots, some 20+ years later). 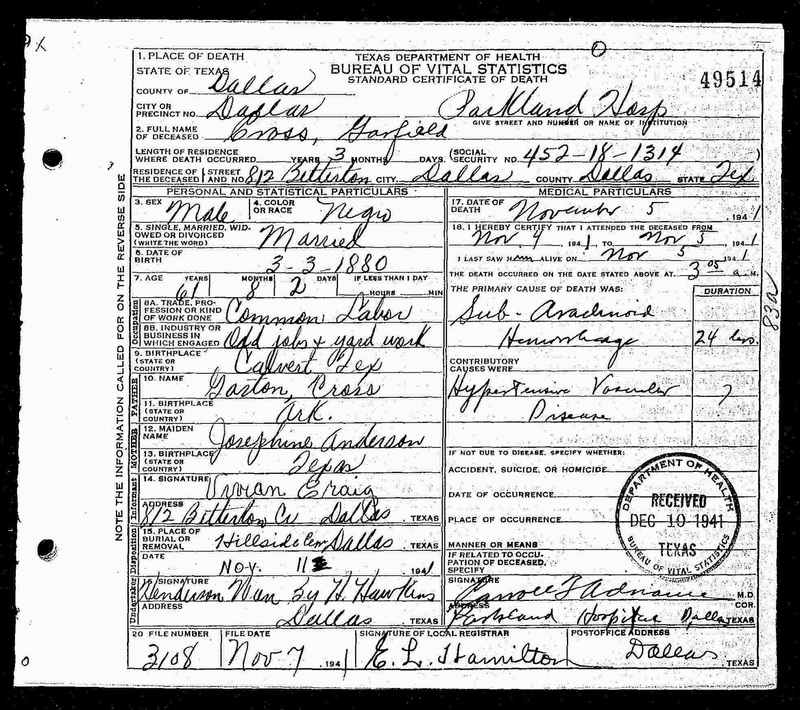 The informant for the certificate was listed as Vivian Craig of 1812 Betterton Circle, Dallas, Texas (the same address listed as my great-grandfather's!). 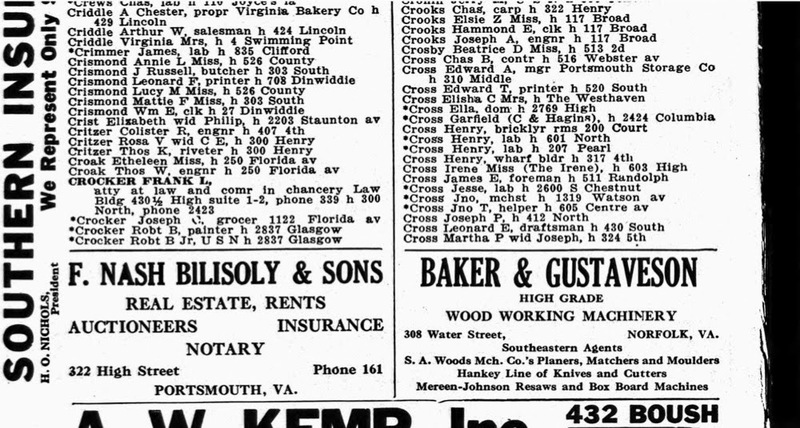 And the undertaker listed was Henderson-Wren Funeral Home (H. Hawkins's signature). It also included his social security number. All of these data points were pieces of information that I could use (and did use!) to cross-check (no pun intended) any future records I might find. By the time that I took over the hunt (2008), Ancestry.com had become a viable option, but still not an overwhelming tool for Af-Am research. But I was able to make some additional connections. My search really took off when I found Familysearch.org. As I mentioned, death certificates have been a boondoggle for me and have helped me confirm many theories. 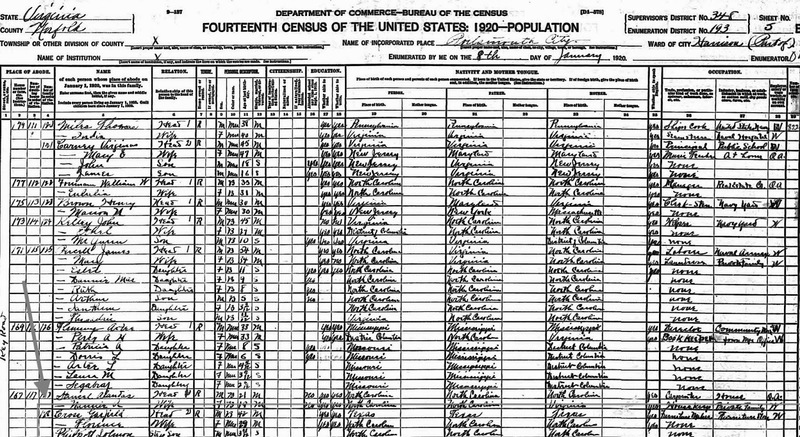 While he appears in prior Alabama census, he also appears in this one in 1920. 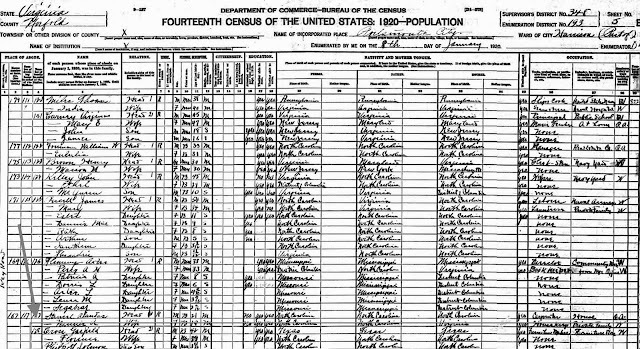 While it is possible that the same man could have been the heads of both families -- because each state and locality may take the census on different days AND because people sometimes listed people who weren't present, but were part of the family -- I thought that ruling out the Alabama Garfield was a reasonable assumption to make, given this evidence coupled with family lore. One additional reason I concluded that Texas Garfield must be the one is because when the Virginia Garfield "appeared" in Portsmouth, VA, the Texas Garfield "disappeared." 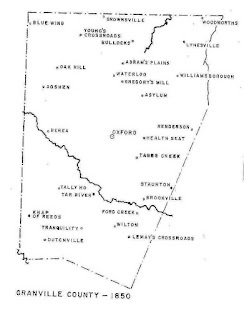 I have not found a single reference to the Garfield in Texas during the time period in which I found (and knew, based on family history) Garfield in Virginia. Likewise, when the Virginia Garfield "disappeared" from Portsmouth, the Texas Garfield reappeared! This is another great tool that I often use. If you are able to find a social security number for your ancestors, you can request (payment required) a copy of their social security application. NOTE: pay the extra money to get a photocopy of the actual document, as opposed to the Computer Extract. The copy has more information on it and you don't have to worry about transcription errors. 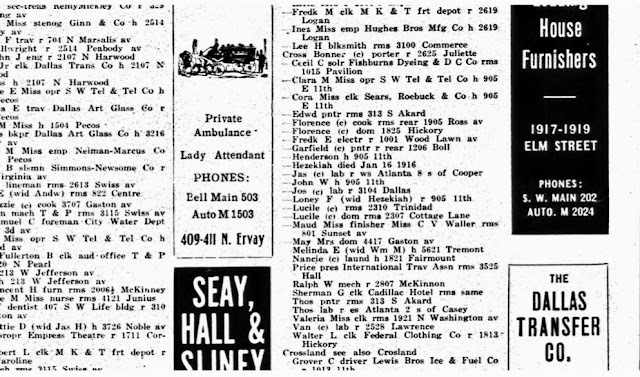 And then I haven't found him again until his death in 1941 in Dallas, Texas. A special shout out to Ancestry.com's new Story View feature. It helped me to identify the references above really quickly. And I love how it pulls a story together from all the minutiae research I've done. It makes it feel more...purposeful. Wonderful post, I felt I was traveling right along with you as you put the pieces together concerning your ggrandfather. Job well done and good detective skills searching for your g-grandfather. Welcome to the world of blogging. Great post!! Really great research work. Interesting story and good research! Great post! Your story was so interesting, I felt like I was searching with you. I can't wait to read more of your story.